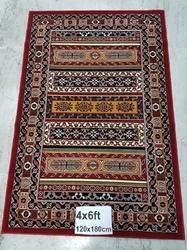 We are a leading manufacturer & exporter of kashmir hand-made hand-knotted carpets from India. Made using 100% pure silk, silk/cotton, art/silk and wool, our carpets are available in different knot density & quality as per bulk buyer's need. The exuberance of traditional Persian-kashan, kums, hamdans and floral designs are well reflected in our range. We also offer hand-made chain-stitch rugs made up of wool, art-silk(sheeba) in all traditional kashan, tribals, kelims and all-over floral designs. The wool-jute dhurry offed by us is in best count of wool in all antique and pastle colors with best tribal designs and is made in all standard size. Sizes & designs can also be made as per buyer's requirement. We are offering an artistic collection of Carpets and Rugs that is creatively and innovatively woven by our experienced artisans. These are crafted using quality thread that provides durability as well as strength to them. Moreover, these are available in various designs, sizes and colors to suit the varied requirements of the clients. We are engaged in offering an attractive range of Hand Made Durries that is available with elegant designs and patterns. Our durries are crafted using quality fabrics and yarns, which make these ideal for long-usage. These durries are usually used to cover expensive flooring and carpets against sun, wear-and-tear and food spillage. Moreover, these are cost effective and have perfect finishing and stitching. 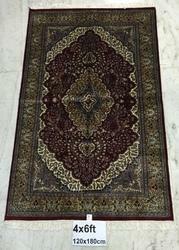 We are offering a wide assortment of Silk Chain Stitch Rugs that is embroidered with the technique of continued stitches. These are ideal items for floor covering and are available in various sizes and shapes. 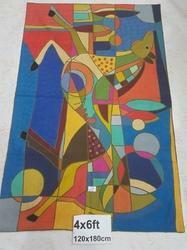 Moreover, we also customize our rugs to meet the demands of the markets across the world. With our rich industry experience and skilled workforce, our organization has been able to offer an enticing range of mordern art picasso Woolen Chain Stitch Rugs. 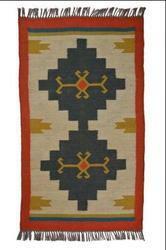 We lay great attention to each detail of design, prints and patterns; while manufacturing these rugs. These are offered in natural, bleached and solid colors. Our impeccable range of hand-knotted woolen carpets are available in different knot density varying from 200 knots to 400 knots in per sq.inch. In order to meet diverse needs of clients, we make these hand-knotted woolen carpets in sizes ranging from 30x45 cms to 360x540cms. 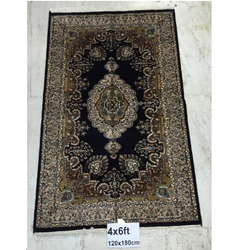 Sizes: 30 x 45cms (1'x1.5') to 360 x 540 cms (12'x18') Yarn: 100% Natural wool Design: Persian – Kashan, Qums, Hamdans and Floral designs Variety:200 knots to 400 knots in per sq. inch Colour Combination: Variety. Packaging Details: ROLL PACKING IN POLY BAG. 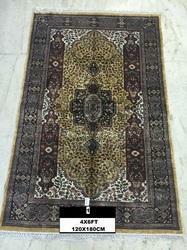 We offer you hand made hand knotted art silk(staple synthetic rayon) carpets. Available in traditional,persian and in modern designs. We offer you exlusive range of 100% Cotton stone wash dhurries in Assorted designs colours and sizes. 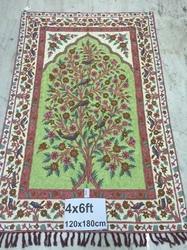 We offer you huge collection of jute and wool printed dhurries in assorted sizes designs and colours. We offer you huge variety of Jute and cotton dhurries in Assorted sizes,designs and colours. We offer you best collection of 100% cotton printed dhurries in assorted sizes,designs and colours. Customized sizes and qualities can be made as your requirement.